Are you a music lover? Do you love listening to new tunes and mesmerizing songs? A lot of people around the world categorize themselves as music lovers, but not many have the talent to label themselves as music creators. Creating music is indeed an activity that requires not only concentration, willingness, and passion but also bucketloads of talent. Very few musicians are talented enough to become renowned musicians. They tend to be very experimental. They believe in creativity and, hence, try new styles and instruments and create new tunes. The 5-string bass guitar is amongst this list of instruments used by musicians to practice their passion and give birth to breathtaking and applause-deserving music. It is an instrument that has been used widely for a very long time to create music. 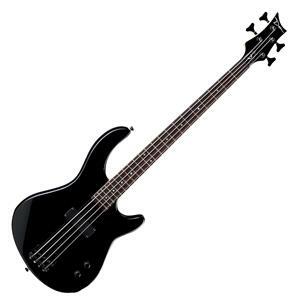 The 5-string bass guitar is very similar to the normal electric guitar, but it has a longer neck, and its scale length is also higher than the average guitar. This guitar has exactly five strings on it as well, which makes it unique. There are certain specific techniques of playing this guitar, though, like slap and pop, picking technique, palm-muting, fretting and strumming. The 5-string bass guitar is very commonly used by popular bands and singers for their musical compositions because it is the bass guitar which composes the bass line of the song and provides the framework. This guitar’s usage is not limited to only one kind of music; it is needed to create tunes in a variety of music styles. 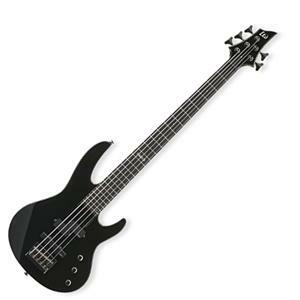 Since 5-string bass guitars provide a lower range than a simple guitar, it is considered to be ideal for rock music and metal genres. Jazz is another genre of music which requires a 5-string bass guitar to give a lower tune to the song. 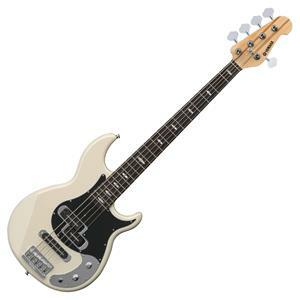 Although the function and importance of bass guitars vary according to the style of music, their presence is generally needed. 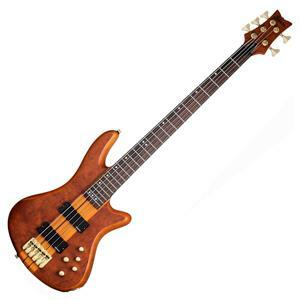 Here is a list of the best 5-string bass guitars available! The Ibanez SRFF805 is a multi-scaling guitar. This particular feature of the instrument might initially intimidate newbies, but it is believed that after a minute or two of playing the instrument, guitarists get used to it and play comfortably. The multi-scaling system of this guitar is present to give each and every string better tension. This tension helps create a tone that is more open and alive. The scale length of the SRFF805 is 34 inches on the G-string side, while it expands to 35.5 inches at the low B. The way the scale is designed is such that it coordinates with the way a player’s hand is placed on the instrument. It has numerous amazing features which make it an ideal choice for a seasoned guitarist and a great learning experience for a newcomer! 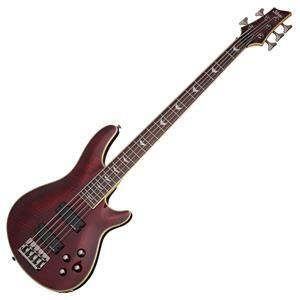 The Yamaha BB Series Handcrafted is a 5-string bass guitar that gives a very strong bass presence in the music. This presence, coupled with the perfectly defined low ends, makes this guitar a must-have for all passionate guitarists who wish to experiment with new styles and create mesmerizing music. This guitar also offers Diagonal Body Thru Stringing which makes it a very comfortable and easy-to-hold instrument for players when they are in their sitting or standing position. Some other amazing features of this guitar include its spline joint, open face pickups, 5-piece neck and nickel silver nut. The strong bass provided by the Yamaha BB Series Handcrafted guitar makes it ideal for every guitarist and lands this product on the list of the best 5-string bass guitars. If you wish to have warmth and smoothness in your tone along with some strong bass, the Schecter Stiletto Studio-5 guitar should be your first and foremost choice. The well-thought-out design is definitely a plus point because it provides comfort to the player and helps hold the guitar easily. The mahogany body and rosewood of the fretboard coupled with the honey satin color of the guitar make it aesthetically pleasing along with being pleasing to the ears. The active 3-band EQ and EMG pickups let you create a huge variety of bass tones and satisfy the exact demand of the guitarist. The Sterling by Music Man RAY35-NT guitar has a swamp ash body which supports the musician in creating a wide range of tunes. If you are focusing on low tunes or mid-ranged and high notes, this guitar has your back! The light weight of the body allows the tunes to be brought out clearly and distinctly. The 3-band preamp of the guitar lets the guitarist experiment with a range of variations, and the humbucking pickup allows the guitarist to play classic warm tones. The 6-bolt neck joint of the guitar is also a great addition to the instrument because it allows tone transfer to be smooth, stable and strong. The affordable price of the guitar is definitely a plus and, coupled with the numerous features of this guitar, makes it the ideal choice! The Schecter Omen Extreme-5 turns out, indeed, to be a good omen for a guitarist. 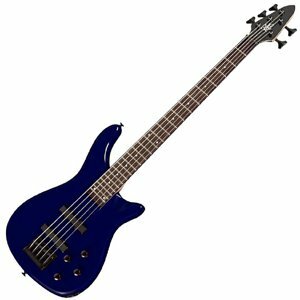 It is not only pleasing to the eye because of its mahogany and maple body, but this 5-string bass guitar also helps the player perform extremely well due to its numerous amazing features. The 35″ scale, active 2-band EQ, premium hardware, and Diamond pickups make it a must-have for every performer who wishes to give nothing less than the best to their passion. It creates tones and basses which are strong and make their presence felt in the music. 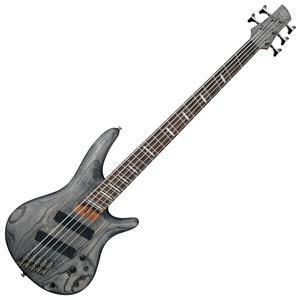 The Schecter Omen Extreme-5, with its overall look and features, is ideal for every bassist who wishes to produce serious music. 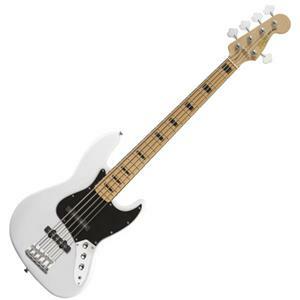 The Squier by Fender Vintage Modified Jazz is definitely the ideal 5-string bass guitar for you if you wish to give your music a legendary bass. It gives a beautiful and traditional feel and sound to your Jazz bass style tones. The guitar comes with a C-shaped slim maple neck along with a vintage-tint glossy finish, which makes this guitar what it actually is – a legendary instrument. Other features that make this guitar a real must-have include a 9.5-inch radius of rosewood fingerboard with 20 frets with a size of a medium jumbo, four-saddle bridge, tortoiseshell pickguard, open-gear tuners and chrome hardware and control knobs. All of these numerous features add together to give the guitar a superior feel and sound. Epiphone brought back the old, classic bass that guitar players had been trying to find with its Toby Standard-IV. This guitar sports the classic ergonomic Tobias-designed body that many bassists find enjoyable to play with and are comfortable holding and performing with. The design of this guitar is such that it suits the player whether they are in a sitting or standing position. It provides a finished and focused sound that has the punch provided by an upright guitar with the clear details provided by an electric guitar. Whether you are on the stage or in the garage, the Toby Standard-IV will offer perfectly balanced and rich sounds with a great playability! The Toby Standard-IV is the perfect choice for anyone who wishes to bring back the classic bass and give their music a strong presence and focused sound. The ESP LTD B55 is a simple, easy-to-use guitar, but there is a lot more present than what meets the eye. 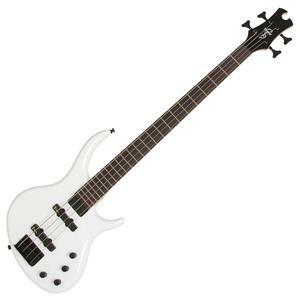 It is a 5-string bass guitar that has 2 ESP pickups which include a split coil and single coil. These two pickups meet and give way to a huge range of different and gutsy tunes. This guitar is rightly called simple yet deadly. The Agathis body, maple neck and an extra-jumbo rosewood fretboard of the guitar make it fairly easy to play. One tone control along with two volume controls allow the guitarist to experiment and try new tunes with this guitar. It is not only easy to play but also easy to hold and perform with. The Rogue LX205B 5-String Series III guitar is surely every bass guitarist’s dream come true. The basswood dual cutaway body of the guitar, maple neck, and a fingerboard made of rosewood make this guitar not only easy to hold but also beautiful to look at. The saddle bridge of the guitar is also adjustable to a great extent and adds to the comfort provided to the player. The J-style pickups of the guitar allow the musician to produce massive slabs of classic tones and are tweaked via 2 volume and 2 tone controls. The die-cast tuners and black hardware of the guitar give additional benefits to the instrument and, coupled with a nicely affordable price, make it a must-have product. The Dean Edge 09 guitar gives the guitarist an edge from the very beginning. 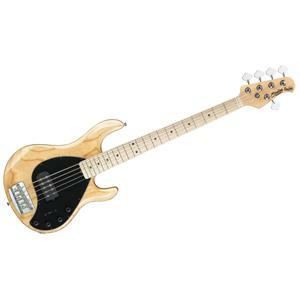 The 5-string electric bass guitar has a body designed to provide the utmost comfort to the player. The maple neck is designed to be smooth and fast and allow the musician to play easily. It also comes with a Dean-design neck joint and heel as well as an asymmetrical 4-bolt pattern, which offer the musician unrestrained movement up to the 22-fret neck. You will find that a single soap bar pickup can generate a substantial growl; such is the clarity and distinctiveness of every string. This guitar is smart-looking and comfortable due to its black hardware and mahogany body. This guitar allows the player to test their skills and experiment with 100% comfort!